All season long, the 49ers have been too generous. Going into Sunday’s game against the Seahawks in Seattle, San Francisco ranked next-to-last in the NFL in turnover margin at minus-17. 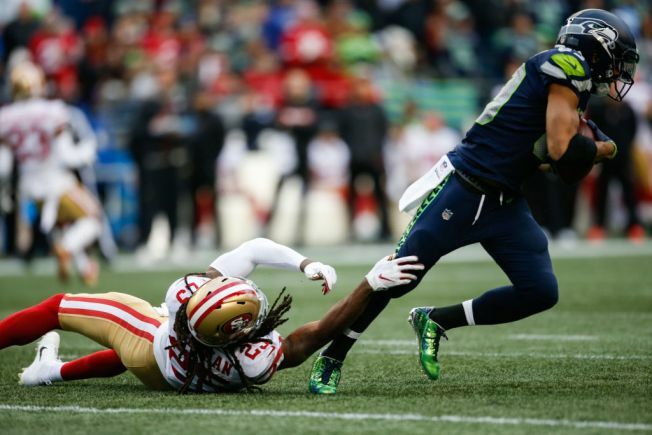 On Sunday, the 49ers gave up the ball three more times in losing to the Seahawks 43-16 at CenturyLink Field. The Niners fell behind quickly, 20-0, by the second quarter and never seriously challenged their NFC West rivals. Only Robbie Gould’s 45-yard field goal just before the half got San Francisco on the scoreboard. Then, Seattle quickly upped its lead to 27-3 on rookie Rashaad Penny’s 20-yard TD run in the third quarter. The 49ers scored two of the next three TDs in the game, with rookie Dante Pettis catching 17- and 75-yard scoring passes from Nick Mullens, but even that flurry of points left San Francisco trailing 34-16. Seattle tacked on nine more points on a field goal by Sebastian Janikowski and Bobby Wagner’s 98-yard interception return of a Mullens pass (the kick failed). Mullens was 30-of-48 passing for 414 yards, the two TD passes and an interception, while being sacked three times. Pettis, who had a big game last week, continued his surge, with five catches for 129 yards. But, the interception and two lost fumbles – by receiver Richie James and running back Jeff Wilson – didn’t aid San Francisco’s cause. The 49ers fall to 2-10 with the loss, while the Seahawks climb to 7-5. San Francisco returns to action this coming Sunday at Levi’s Stadium against the Denver Broncos.